Miguel Díaz-Canel Bermúdez , President of the Republic of Cuba, and Nicolás Maduro Moros, President of the Bolivarian Republic of Venezuela, in Riverside Church in New York City. Photo credit: Gloria LaRiva. 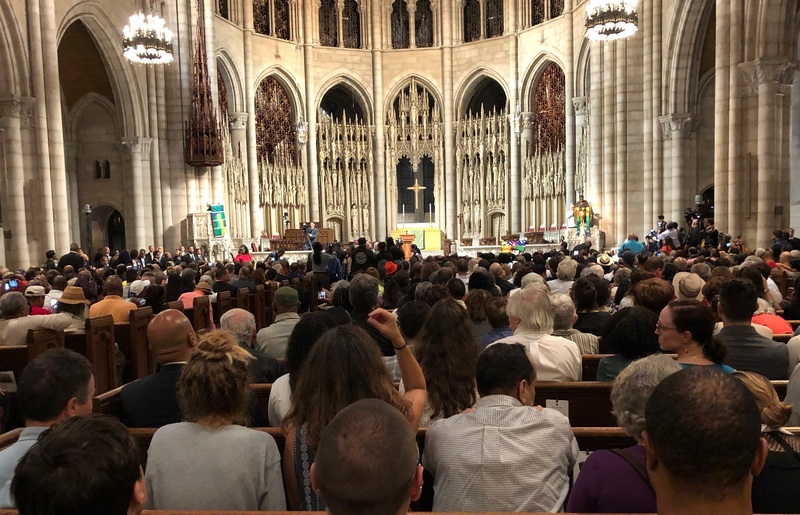 More than 2,100 people packed and overflowed New York City’s historic Riverside Church on Sept. 26 to warmly greet Miguel Díaz-Canel Bermúdez in his first visit to the U.S. as President of the Republic of Cuba. Díaz-Canel was in New York to address the opening of the 73rd session of the United Nations General Assembly. The name of the meeting, “Cuba Speaks for Itself, ” was especially apt. The establishment media’s steady invective against Cuba rarely allows that country’s leaders to counter with their viewpoint. Tonight Cuba did speak for itself tonight and its message was solidarity. Díaz-Canel highlighted the solidarity that the African-American community in the U.S. has given to Cuba. He expressed appreciation for the solidarity progressives in the U.S. and around the world have shown for Cuba as it struggles against decades of a U.S. blockade. The crowd, which had waited on long lines for hours, and endured extensive security checks to enter the church, rose to its feet with joyous cheers when a surprise guest took the podium–Nicolás Maduro Moros, President of the Bolivarian Republic of Venezuela. “We have been victims of immense imperialist aggression, but today I can say that the Bolivarian Revolution of Venezuela is still standing, alive and victorious,” Maduro concluded, to huge applause. 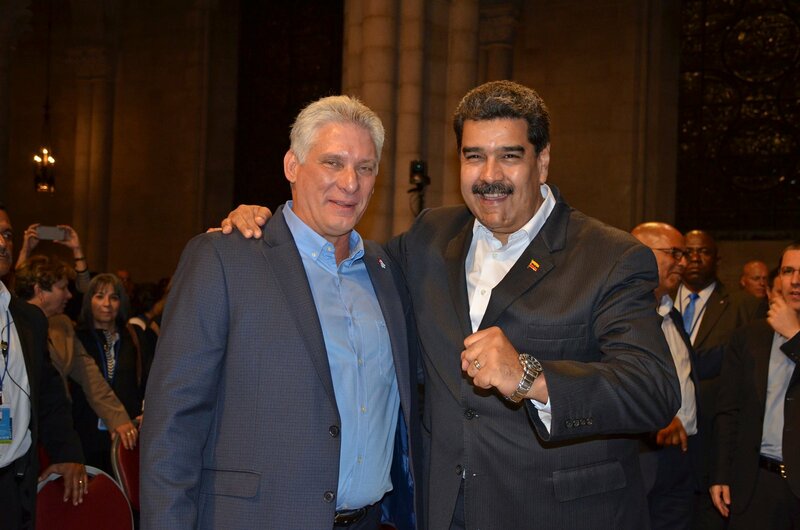 Maduro was also in New York for the UN General Assembly session opening. President Miguel Díaz-Canel began his speech referring to the presidents’ UN talks. “Today at the United Nations, two sister peoples raised their voices. Venezuela denounced all the aggression to which it has been subjected and also ratified its decision to continue the Bolivarian revolution, as a legacy faithful to Comandante Chávez,” he noted. “Cuba also raised its voice with Venezuela, to support Venezuela, to support Nicaragua, to support Puerto Rico, to support Latin America, to support the Palestinian and Sahrawi people, and to support all the just causes of the world. And also to denounce, once again, the unjust blockade that, for almost 60 years, the United States has imposed on us,” he continued. “For Maduro, for Venezuela, for the Cuban delegation, it is very emotive to be here with you, friends of Cuba and Venezuela here in New York. 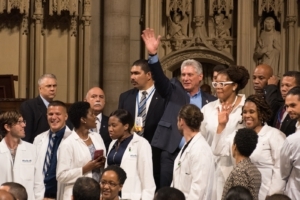 Miracles like these happen in this city only here, in the Riverside Church,” the Cuban President stated, stressing that this meeting, in a cathedral of faith and solidarity, was a gathering of brothers and sisters, of friends, of equals. Díaz-Canel with U.S doctors trained in Cuba’s Latin American School of Medicine. Liberation photo: Vincent Tsai. Díaz-Canel recalled that here at Riverside Church in 2000 Fidel announced before 3,000 people a program to train people from the U.S. to become doctors free of charge at Cuba’s Latin American School of Medicine, if they worked in under-served areas upon their graduation. A delegation of these graduates was present, and Díaz-Canel said he would take a picture together with them at the end of the program. “Cuba is not a large or powerful country. It’s not rich in natural resources. But these limitations have not stopped us from practicing solidarity on the basis of sharing what we have—not giving away our leftovers—but actually sharing what we have. It’s a sacrifice in solidarity which is practiced with humility and which has had an impact for several decades on the lives of millions of people in several continents,” said Díaz-Canel. He said that tens of thousands of Cuban professionals, particularly medical staff, are now giving service in over 75 different countries. “They represent more than the 1 million Cuban professionals who have served in Africa Asia, Latin America and the Caribbean since the triumph of the revolution…. “The greatest endeavor of international solidarity of the Cuban revolution was its support of the African liberation movements.” Here, Cuban troops protected “the sovereignty and integrity of Angola, defended Namibia, struck a blow to the war machine of the apartheid regime in South Africa. “This is why, when Cuba comes to the United Nations General Assembly and promotes cooperation and solidarity, as opposed to threats, competition, racism and selfishness, Cuba does so with the authority of the people who have shown that it is possible to achieve those goals in a country that has turned words into concrete actions,” Díaz-Canel said. “Cuba also owes a lot to international solidarity and to the help of many friends and activists here in the United States, among whom are many Cuban residents,” he continued. He referred to the struggle to free the Cuban Five, and to return the Cuban child, Elián González, to Cuba. He stressed that bilateral relations with the United States continue to be characterized by the economic blockade, which constitutes an obstacle to the development of the Cuban people and has caused huge deprivation to Cuban families. Díaz-Canel also talked about current democratic practices within Cuba. “The task at hand for the Cuban nation,” he said, “is the mass popular discussions of the Cuban constitution” currently going on. The new constitution draft is being discussed by all Cubans, including those living abroad, between August 13 and November 15. After input and revisions, it will be adopted by a national referendum, replacing the 1976 constitution. Part of the overflow crowd at Riverside Church. Liberation photo: Joyce Chediac. The Cuban president ended his talk by remembering those revolutionaries who came before, like Fidel Castro and Hugo Chávez. The crowd rose in in a standing ovation to his final words, “Today we say to you Fidel and Chávez presente! Viva the Bolivarian revolution of Venezuela! Viva the Cuban revolution! Long live—solidarity! Hasta la Victoria siempre! 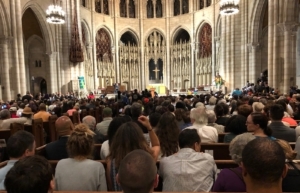 The Riverside Church event was organized by a coalition of New York and New Jersey solidarity organizations, including the Interreligious Foundation for Community Organization/Pastors for Peace, the Venceremos Brigade and the July 26th Coalition. IFCO director Gail Walker and Puerto Rican activist Frank Velgara co-emceed the event. Adding to the evening’s rich cultural experience was the Healing Drum Collective and a Riverside church choir group. Among the U.S. Cuban solidarity activists recognized from the podium, recipients of Cuba’s Friendship Medal granted by the Council of State, were Gail Walker of IFCO, Leslie Cagan, Gloria La Riva, and Rosemari Mealy. Among those also recognized were the Venceremos Brigade, former U.S. Congressman Charles Rangel and attorney Michael Krinsky. The next day, a reception was held by progressive groups for Venezuela’s delegation to the United Nations. Foreign Minister Jorge Arreaza gave a dynamic speech to an enthusiastic crowd at the People’s Forum in downtown Manhattan. He outlined the damaging effects of the U.S. economic sanctions in all aspects of the economy. In just one example of many, the U.S. imposes fines on banks that accept transactions from Venezuela. “This year we had to begin our vaccination program in January, to pay the Pan American Health Organization [PAHO], we sent the money, $8 million. To cheers and applause, Arreaza assured the audience that Venezuela will defend its sovereignty no matter the challenges or military threats. President Díaz-Canel had a full itinerary while in New York City. Besides speaking before the UN General Assembly on behalf of Cuba, he rendered homage to the South African revolutionary Nelson Mandela at the UN Nelson Mandela Summit for Peace. He met with various heads of state at the UN, visited Ground Zero to honor the victims of the 9/11 attack. He also had a special meeting with Cubans residing in the United States, and meetings with religious leaders, with industry and agricultural executives and a special encounter with cultural artists of New York City.